I’m a few weeks late on this post, but I’m always thankful for my dive buddies. While I often end up diving solo on many local boats with my nose to my camera screen, it’s always fun to step back from those serious photography dives and just cruise around with a couple friends. 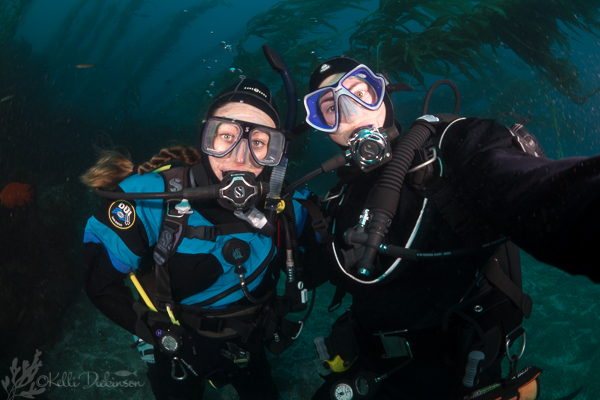 After Thanksgiving this year myself, my husband and a couple friends went out diving for the day on the Peace off Anacapa. We caught the tail end of this beautiful summer here in California (and yes I mean tail end of summer when we were diving on November 29th!!) 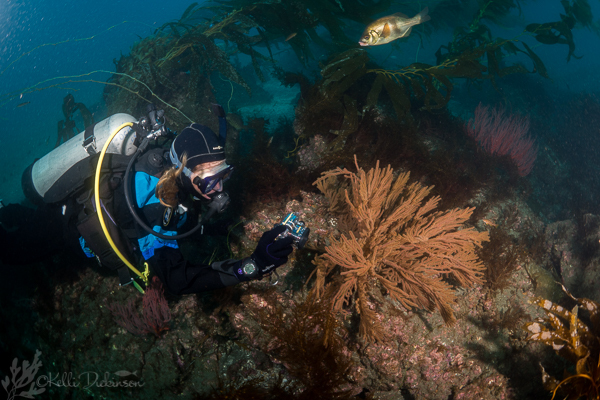 We’ve been experiencing some crazy weather here in SoCal with extremely warm water temps which have unfortunately killed much of the kelp around the local islands, but also brought clear visibility, comfortable diving temps and unique sightings. 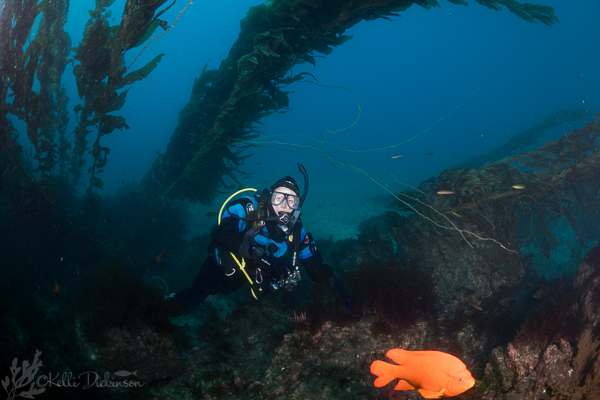 This dive at the end of November hearalded the beginning of classic California season, as the water temp had dropped at least 10° from my dives a month prior and the viz was diminishing. Regardless, I had two great dive buddies keeping me company underwater and posing as models (whether they realized it or not!) It was a blast to swim with friends and just enjoy a laid back day of diving! On Saturday I had my first trip with Bluewater Photo. 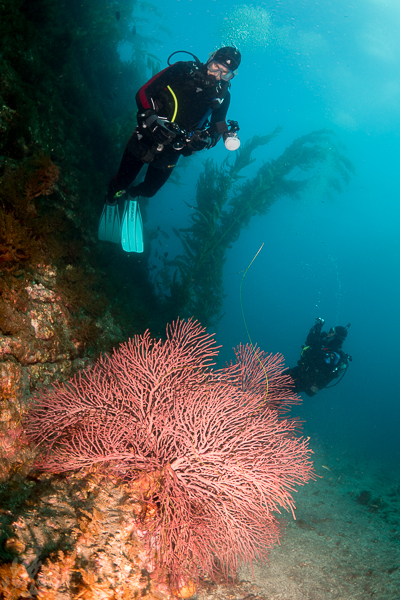 We went out on the Peace dive boat to Anacapa Island, for four fantastic dives. Once again, in what is starting to be a really nice trend, we had summer like weather. It was sunny and warm and the visibility was upwards of 50 feet on average! To top it off I was testing out a new camera, the Olympus E-PM1, the latest in their line of mirrorless cameras. In addition I was using the Panasonic 8mm fisheye lens with Precision dome port. This was my first time getting to actually shoot wide angle, and let me just say… I LOVE this fisheye lens! I was still using a single strobe, and that made it difficult at times; I can definitely see how two strobes are basically necessary for such wide angle shots. Half the time I had a nicely exposed foreground and background, but black in the middle… or only half of my image would be properly exposed leaving the rest very dark. It was hard to work around, but really got me to appreciate the importance of strobe placement! In addition to practicing some lovely reef shots I also practiced with silhouettes and got a great shot of a harbor seal! 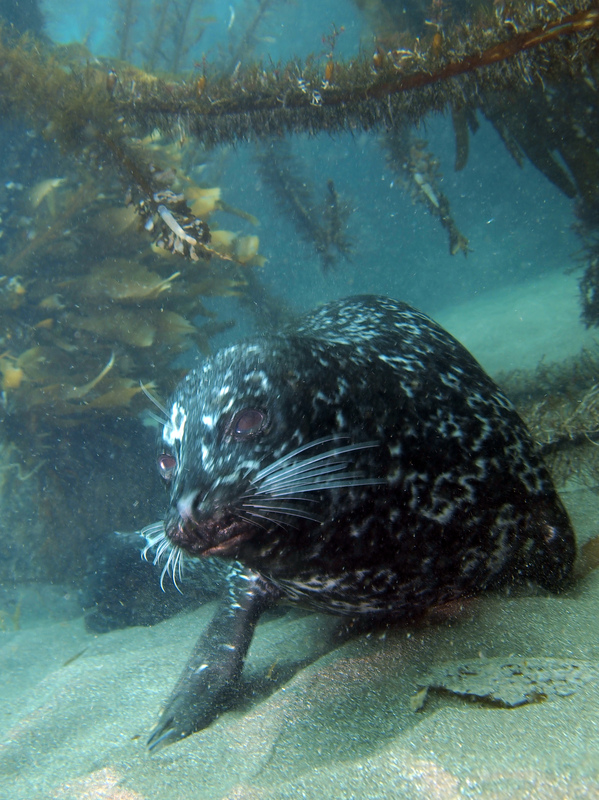 We dove with sea lions at one of the rookeries, hit up Landing Cove where I found the awesome swim through, stopped at Rat Rock, with a floor covered in brittle stars and lastly dove Channels where a friendly family of harbor seals hangs out. I had a great day mingling with the new group of divers on the Bluewater charter and can’t wait for the next one! Here is hoping this warm weather, calm seas and awesome viz trend sticks around for awhile!! 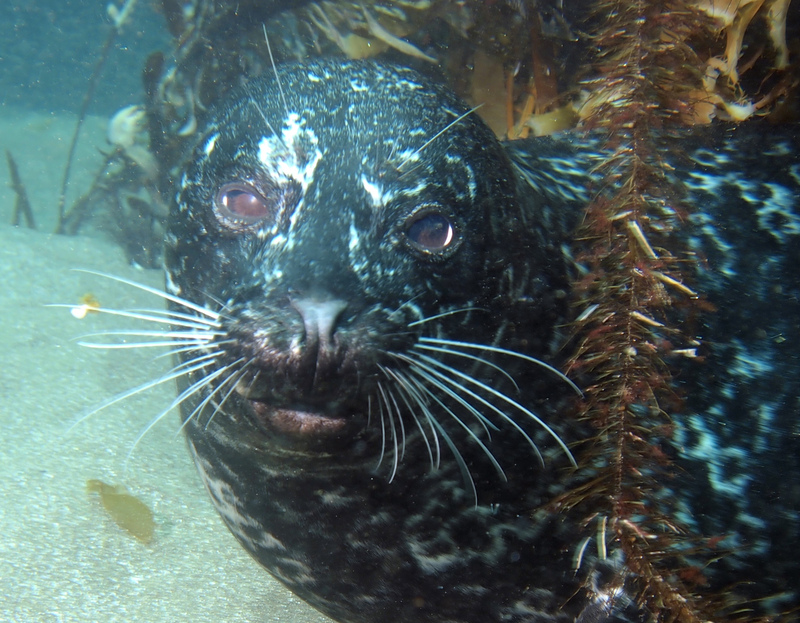 At the end of the third dive as I was headed back to the boat I saw something dart through the kelp ahead of me. Rounding a corner of one of the rock channels I saw a harbor seal laying in the sand. He looked up, saw me and darted away before I could get a picture. 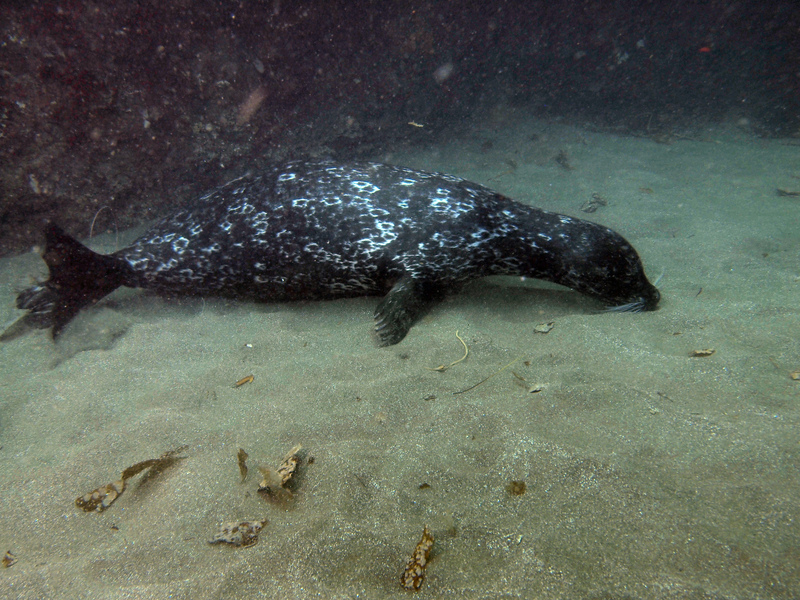 Excited because I haven’t seen a harbor seal under the water while diving as of yet, I continued on to the boat. As I neared the anchor chain, macro lens put away and camera set as wide as possible, just in case, I came across him again! He was slithering along the bottom, nose in the sand looking for something to dig up and eat I expect. Either not hearing me or just ignoring my presence he continued along before darting away again after a few minutes. Surprisingly, he kept coming back! As one point he swam over and settled into the sand right in front of me, watching me fumble with my camera, hoping to get it into position and snap a decent shot. He never settled quite long enough for me to take a couple shots, so it was either you got it or you don’t type of situation. I was excited about this shot, though in order to have the background exposed properly I had the shutter speed set too slow to capture the seal crisply. The strobe froze him in place, but the longer shutter speed allowed him to blur after the strobe had fired. Next time, I ought to open up the aperture so that I can stop down the shutter speed in hopes of still having a well exposed background and a nice crisp critter! One last try, before needing to give up and head back to the boat, but I guess I got too close (seriously was worried as I inched nearer and nearer that he might try to bite my camera or myself, but he just sat there watching me) and my flash was a little over powerful, he even had to squint! Overall I found it incredible how inquisitive this guy was, and how huge! The seals always seem smaller compared to the sea lions, and they are a little bit, but they are still pretty huge! I got to sit and watch this guy cruise around the kelp and dig in the sand. I watched him chase a fish nearly catching it. It was incredible. Just wish the viz had been a little clearer, and the surge a little less so that there would be less sand and particles floating around in the water! Sunday morning my buddy Neil and I drove up to Ventura for a two tank trip off Anacapa aboard the Raptor dive boat. The morning was chilly and grey with the sky spitting a few rain drops as we drove up the PCH. Luckily though, the seas were calm, and it was a smooth and quick ride over to the island. The Raptor is a great boat if you’re looking for a quick and easy Channel Islands trip. Its a smaller open boat, so everything’s going to get wet, but its fast and the service is fantastic. Between dives they offer a spread of sandwiches and fruit as well as always a hot dish, Sunday it was chili and it was delicious, especially while hanging out in the cold air after a cold dive. 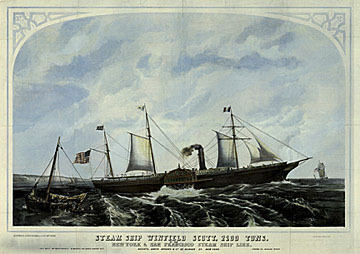 The site we pulled up to was called Winfield Scott, named so because of the sidewheel steamer, SS Winfield Scott which crashed in that spot on December 1, 1853 after trying to navigate a heavy fog. It was headed from San Francisco to Panama on its usual route carrying passengers and a large cargo of approximately $2 million in gold when it ran aground on Middle Anacapa. Capt. Joe mentioned that this site held several interesting features, one being the remains of the wreck of the Winfield Scott, mostly the paddle wheel. 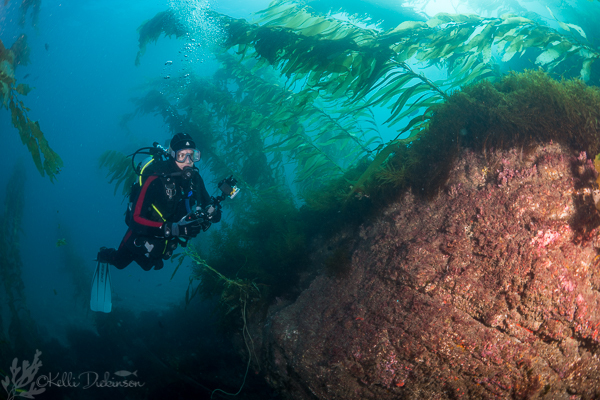 Other features were a few swim throughs close to the islands and large thick kelp beds. The whole site was really shallow with anything worth seeing being no deeper than 40 feet. 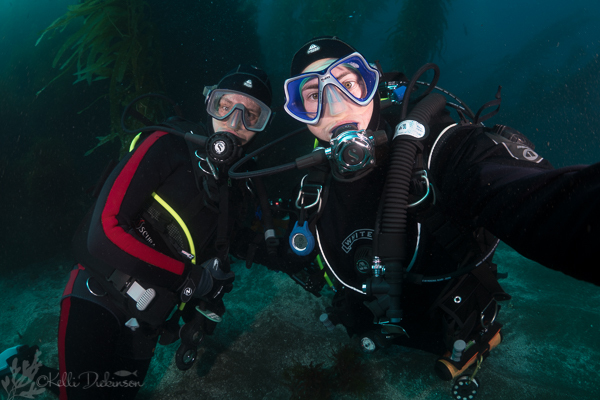 Neil and I joined up with Betsy, another diver in need of a buddy and we decided to head towards the island through the kelp and to the swim throughs. This was easier said than done. The kelp was thick and as we wove our way through it we quickly got off course. 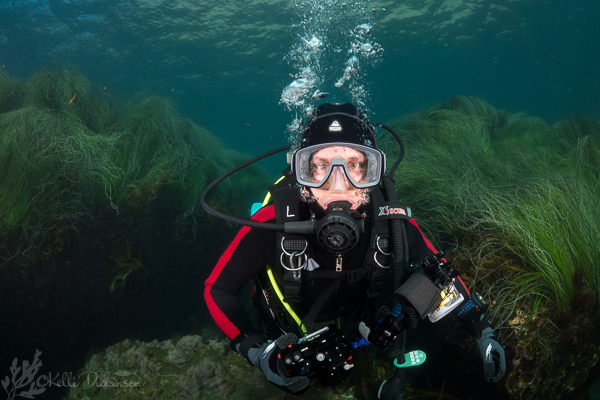 Finally finding a small opening in the kelp, and being at about all of 15 feet down I popped up top, signaled the boat I was okay and quickly looked around for my bearings. I noted that we were probably only 10 feet from the main swim through, but it meant navigating more kelp and we were sick of it. I realigned myself with the boat, dropped back down and we high tailed it out of there. Once back at the boat we ran into a group of students finning along mucking up the sand as they learned to control their buoyancy, so we headed in the opposite direction. I found a nudibranch I hadn’t seen yet, Hermissenda, which was exciting and we happened upon a large Sheep Crab. Other than that there was not much in that direction so we turned around and went back towards the direction of the wreck. Nearing the end of the dive we saw a long pipe nestled on the bottom and searched around hoping to be near the wreck. I started thinking, maybe its more degraded that the captain let on until suddenly we went through a bit of kelp and Neil turned around and signaled me. Turning back he spread his arms wide as if to say, Ta Da! and there in front of us was the large side wheel structure. Around it were more bits and pieces of the remains, all fully covered with growth. Our time was short as we were nearing the end of our air, so we headed back to the boat. Luckily the captain said that the decision had been made to stay at that site for dive #2, so after a surface interval full of chili and cornbread and we were back in the water. 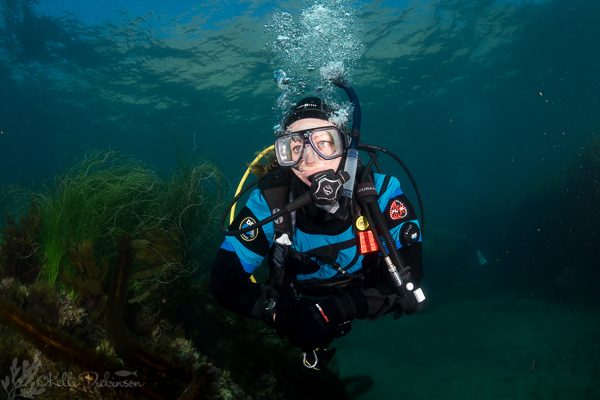 Our plan was to keep the dive shorter, we were still chilly after our first dive of about 54 minutes, and fully explore the wreck area again. We gained a diver, Brian, after his buddy decided not to do the second dive, so the four of us headed towards the wreck. I ended up as navigator again, and I kept an eye out for the pipe that signaled us that we were in the area. 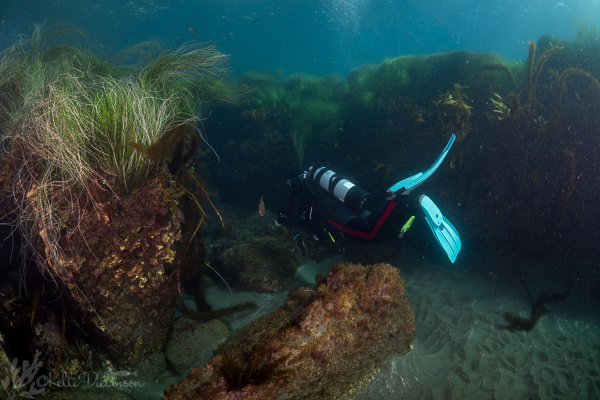 Finding that we started into the kelp to find the large wheel structure. 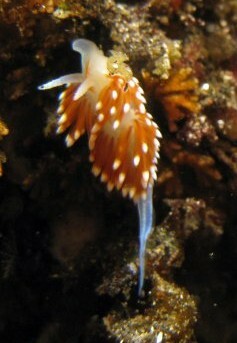 I came across a few more nudibranchs, several Spanish Shawl and another new one, Triopha maculata! 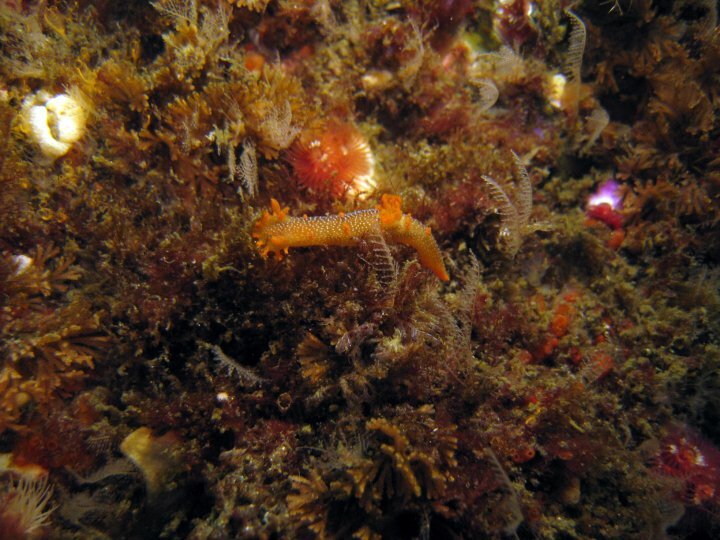 Our dive ended up being a little over 40 minutes as I was engrossed in exploring the wreckage and the surround rocks hoping for more new Nudi sightings! We made it back to the boat easily, and quickly enough that I didn’t think we were there until Neil abruptly grabbed my fin and poined out that we had just swam past the anchor line! Below is my little video around the wreck, enjoy!